Before or after a run, or even during a workout, if you need a quick burst of energy and something to get you through, this is the nugget for you. This recipe is very forgiving, so feel free to get creative with the ingredients. For instance, you may want to use raisins instead of dates, or use figs instead. 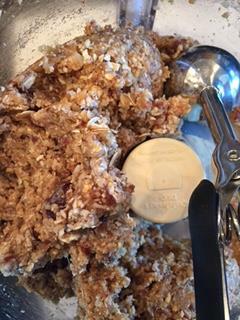 I’ve also used different nut butters; almond butter instead of peanut, etc. The ginger is a kick, so make sure you include it. Combine all ingredients in a food processor and blend until combined. Using a small ice cream scoop—or using whatever method you prefer, roll into 1 ½ – 2 inch balls. Store in an airtight container in the refrigerator.